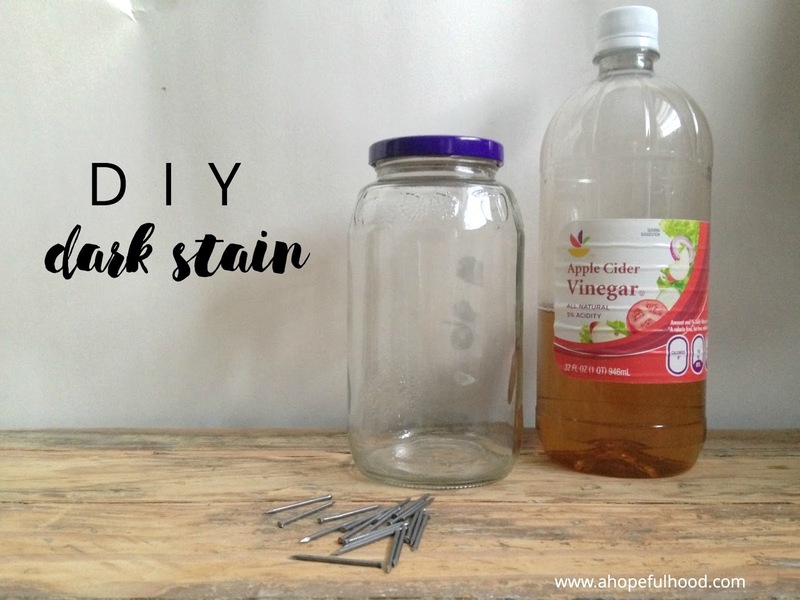 DIY & recipes, DIY projects, Wild Cedar Co.
You only need 3 things for this easy DIY stain, and it's going to save you soooo much money if you were about to buy stain for your next DIY project. I've already admitted I'm a cheapskate, so we can chalk this up to me wanting to save money. It will also be super useful for my Etsy shop stuff! Up until now, Courtney and I have been using a Jacobean stain stain for our Wild Cedar Co. signs, but now we're going to try using this method since it fits with our whole "use repurposed materials"/"create less waste" business methods. Make sure to follow our shop on Instagram (@WildCedarCo) for newest updates and coupons! --Vinegar. I buy the enormous gallon-sized jugs of it because it's also an inexpensive cleaner. --1 old container with a lid. Think: salsa jars, jelly jars, applesauce containers, etc. 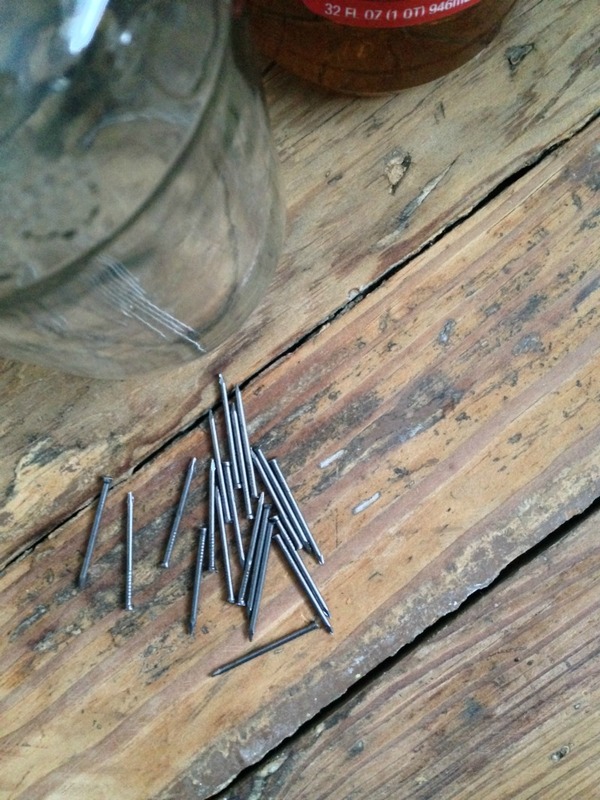 --Nails (or some other old metal scraps?). 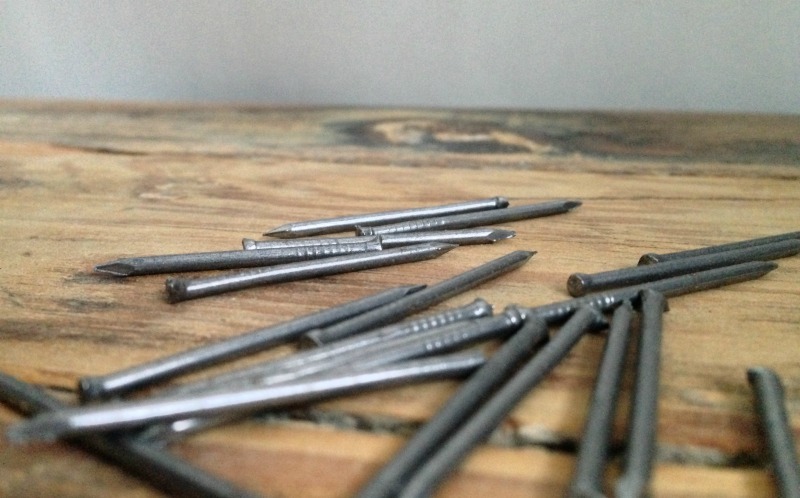 If you don't just have a ton of nails lying around work area/basement floor (what, some of you have CLEAN, non-renovation storage basements?! ), then ask a friend who does carpentry or something. Don't spend money on them, though! 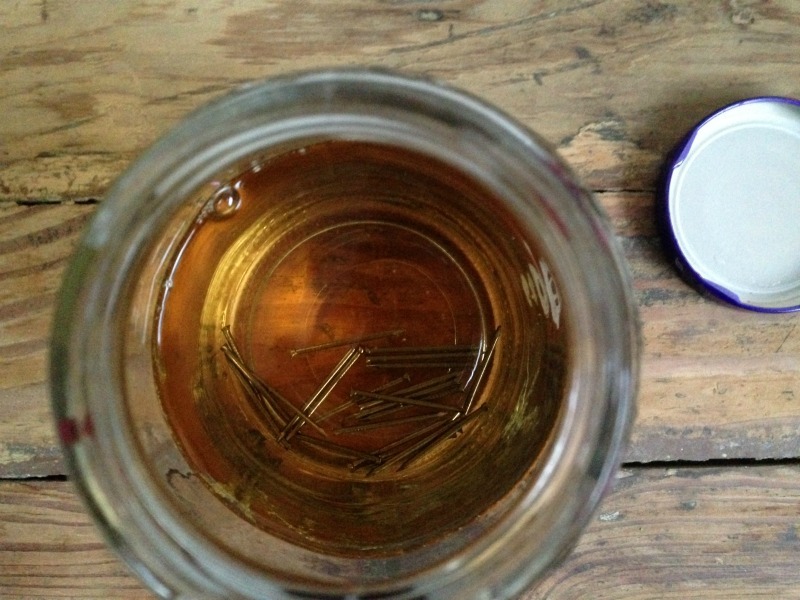 The more nails you have, the quicker your stain will darken in the jar. 1. 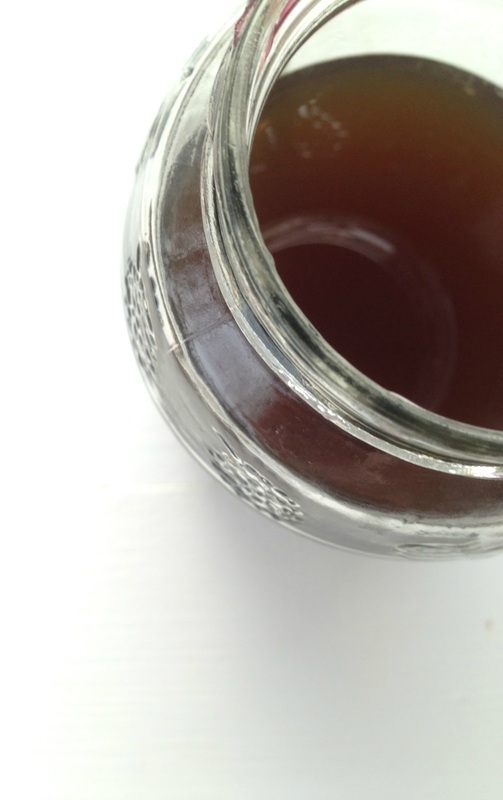 Fill up your jar with vinegar and drop in those nails. 3. 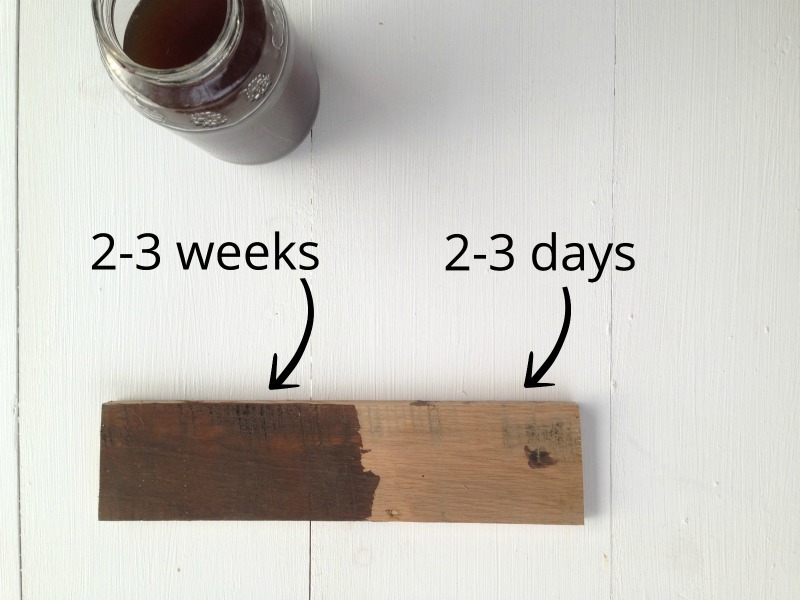 After a few days, test out your stain on a scrap piece of wood. I usually apply it with an old rag or paper towel. Let the wood sit for 5-10 minutes to really absorb the stain, and then decide if the stain is dark enough for your liking. If it's not dark enough, let the stain sit for a few more days. Are you working on any DIY projects? What's your favorite stain color?